Do you want to know what are the Best Gaming Laptops Under 60000 Rupees with a Graphics Card? Find here a list of 7 best laptops under 60000 aimed primarily for gaming purpose you can buy. Most of the laptops included here have the best in class NVIDIA GeForce 1050, 150MX or the 940MX which are best in the class. Of course, they are also equipped with Intel i7 or i5 processors coupled with 8 GB of RAM. 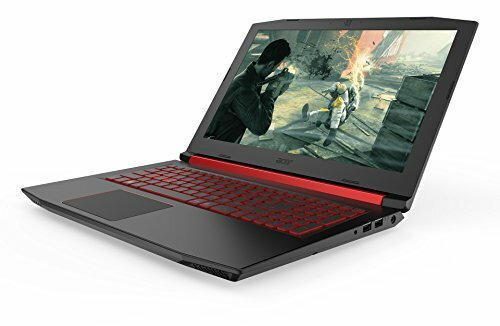 These gaming laptops under 60000 are able to play all modern and popular games like GTA 5, COD (latest), Battleship, Far cry and of course Counter Strike. Since you are here you might also want to check out our list Best 8 Gaming Laptop Brands in India also. , this rather sleek looking device is attested by the NVIDIA GTX 1050 along with an Intel Core i5 7300HQ (7th gen). The Nitro 5 is one of the most beautiful laptops in its class, but since it uses a black and red theme and interesting design accents that suggest it’s not just an ordinary notebook. This keyboard is also backlit, with red LEDs and one brightness level to choose. Sporting an FHD IPS panel with a resolution of 1920 x 1080 the display is the same as most in this gaming laptops under 60000 list. As expected, this laptop handles everyday tasks flawlessly, from multimedia content to browsing, editing, documents and so on. The factor that propelled this laptop to the top spot in our list is the GTX 1050 GPU which is top notch and only seen on laptops priced close to 1 lakh. On the gaming department and we tested out by running the performance intensive game, Watch Dogs 2, it could run at a 60fps while on charge, very impressive given the price. The MSI Prestige PL62 7RC laptop flaunts a 15.6-inch Full HD (1,920 x 1,080 pixels) LED display and is well designed in a silver colored body (383 x 260 x 22mm). Inside, there is a 2.8GHz Intel Core i7-7700HQ (7th Gen) processor placed upon Intel HM175 Express coupled with an 8GB of DDR4 RAM and 2GB NVIDIA GeForce MX150 graphics card. The laptop delivers a great performance and features a battery backup. The dedicated MX150 GPU outputs very nice graphics in the Full HD display and would be able to run most of the demanding games at medium to low settings. We should mention that the NVIDIA Geforce MX150 offers over 63% performance gains over the previous Geforce 940MX graphics, which a lot of laptop in this range are equipped with. MSI’s exclusive Cooler Boost Technology provides for powerful a cooling design by boosting the airflow, keeping notebook and chipsets temperature 5%~10% lower during gaming. The quad speakers featuring Nahimic 2+ Sound technology output crisp clear audio which is pleasant to the ears. The standard connectivity options that you will expect are all available. The Asus K510UQ is one the slimmest and lightest laptops in the Top Gaming Laptops under 60000 list. The laptop is lightweight and beautifully designed with a gold metal chassis. The compactness can be compared to ultrabooks. The bezels are ultra-narrow that gives the laptop an 80% screen-to-body ratio hence looks beautiful. It features a 15.6″ Full HD display, runs on an Intel i7-8550U that can boost to 4GHz, 8GB of memory, 1TB Storage, biometric security with the fingerprint scanner and Nvidia’s GeForce 940MX 2GB GDDR5 dedicated graphics card. On the performance front, it blazes through ordinary everyday tasks like surfing the web or making spreadsheets, it also handled demanding software like Photoshop like a champ. On the gaming department, you should be able to run even the latest games in medium settings thanks to the 8th Gen (not 7th) processor. Asus has done a great job being able to cramp such high specs into such a thin and light laptop. It’s ideal for the gamer on the go! Next up we have another Laptop from Asus – the R558UQ. Its placed on the no 4th spot due to the fact that it is offering Intel Core i7 7500U (7th gen) as the processor which is generally found on laptops with a much higher price tag. We love the fact that Asus did not compromise on any other aspect of the laptop for that, well, maybe we are missing Windows out of the box but that can be easily installed later. The laptop comes with a 15.6 inch Full HD LED Backlit Anti Glare Display with a resolution of 1920 x 1080 pixels, so the picture quality is crisp and detailed. The screen size is big enough for an enriching gaming, surfing and video watching experience. On the memory front, the laptop is equipped with a hard drive of 1 TB and an 8 DDR4 RAM, thereby making it possible to store ample amount of data. All the above features ensure that you breeze through all your tasks throughout the day. The built-in speakers and microphone are powered by SonicMaster and Bang & Olufsen audio technology. It has a USB 3.1 port (USB c), other than that all the basic connectivity options are all available. The Asus S510UN is the 3rd laptop from Asus and the final in our Top gaming laptops under 60000 list. The S510 is one of the nicest 15-inch laptops we’ve got our hands on. This notebook is made from a mix of silver aluminum on the hood and smooth plastic on the underbelly and interior. It gets a matte screen with a tiny black bezel, a spacious enough palm-rest and space for a proper keyboard and a big trackpad. The laptop Is one of the few to be running the 8th Gen i5 processor so you will be future ready, the GeForce 150MX is also more powerful than the GeForce 940MX GPU. This will be an important deciding factor while choosing. With its Nvidia GeForce 150MX, 2GB GDDR5, the Asus S510 is powerful enough to play medium and heavy-duty games and even do some heavy video editing, serious gamers should also be contempt with this system. With daily use, this notebook runs cool, but the fan is active all the time, even when there would be no need for it to spin. It’s also a bit noisy. HP Pavilion 15 ab522TX is a stylish and powerful Mainstream Laptop and is powered by Dual-core clocked at a speed of 2.3 GHz up to 2.8 GHz and sports a 15.6 inch HD BrightView LED Backlit Display that comes with a resolution of 1366 x 768 pixels, so the picture quality is crisp and detailed. The screen size is bright and crisp for an enriching gaming, surfing and video watching experience. On the memory front, the laptop is equipped with a hard drive of 1 TB and an 8 DDR3 RAM, thereby making it possible to store ample amount of data. All the above features ensure that you breeze through all your tasks throughout the day. The graphics performance is great as its equipped with the 4GB DDR3 Nvidia GeForce 940MX Graphics processor with integrated Intel HD 520 Graphics. You should be able to run medium intensive games on this laptop but don’t expect too much because it still runs on the 6th gen processor, another thing to note that the display isn’t Full HD. The IdeaPad 520 is the first and only laptop from Lenovo to feature in our Top Gaming Laptops Under 60000. The Ideapad 520 has the premium feel thanks to its aluminum top and keyboard surround. Sadly, the bottom section is painted plastic rather than metal – but it looks good, nevertheless. The matte 15.6-inch screen uses the IPS technology. Its contrast and brightness levels are just fine. It is still better not to work under direct sunlight. For its price, you get a nice looking laptop with plenty of power inside. Processor and RAM take care of all the power you will need. You will be able to do graphical tasks like Corel Draw or video editing etc. due to the GPU. Modern and popular games should be playable on this laptop in low-medium settings. Witcher 2 and COD during our testing rendered at 50FPS so choose this laptop accordingly. The speakers are fine for daily usage but lack bass. So, if you are into streaming, you are covered. But if you are vivid music listeners who want to hear even the smaller notes, well you better get an external sound card. This is not what this laptop is for. These Best Gaming Laptops Under 60000 should cover your most of you’re gaming needs. It can be difficult to choose a gaming laptop under 60000 in 2018. With such a vast array of companies offering different combinations of different specifications and with different graphics cards. Acer Nitro AN515-51 – it’s the only laptop that is offering the Nvidia GeForce 1050. This GPU is the best of the bunch and is perfectly suited for the configuration that the laptop offers. You get more or less everything that the Acer Nitro offers instead of GeForce 1050. However, GeForce 150MX in the Asus is the 2nd best GPU on our list, where the ASUS trumps over the Acer is the lightweight and form factor. So, this is the list of Gaming Laptops Under 60000. You can share it with your friends as it might help them too. We hope this list of Gaming Laptops Under 60000 rupees will help you in buying a perfect laptop.